TOPIC | [LF] x/y/Latte - PINGLISTS please! 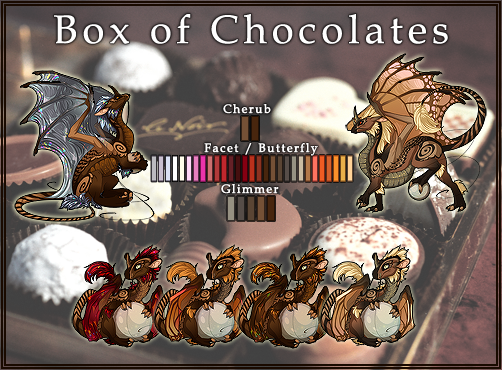 Now that people are slowly starting to update their breeding cards and hatcheries to prepare for the grand color wheel expansion, I figured now is a good time to post about my first planned project involving the new colors. 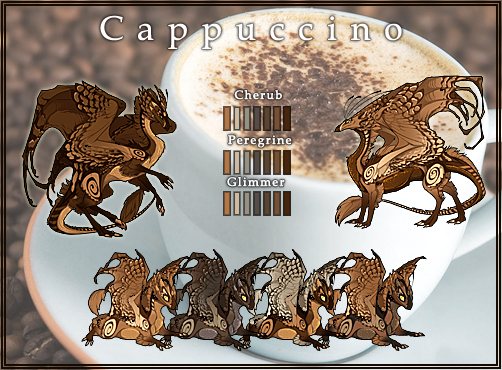 I'd like to start collecting x/y/Latte dragons, where x and y are food colors that, combined together, make for a believable latte drink. And to be absolutely clear, x and y should be different colors; I'm not interested in doubles. Latte sits between Soil and Slate on the old colorwheel, so I'm looking for breeding pairs that have at least those 2 colors in their tert range. Since the new colors aren't available yet, I'm not going to be picky about genes and am okay with buying gene or breed change scrolls to scroll them into something more fitting. That being said, I'm obviously willing to pay more for genes that I like (since it'll save me money over buying scrolls). My hope is to end up with genes that are appropriate for this food-related theme. I'm flexible regarding breeds (again, I'm okay with buying breed change scrolls if I need to) but if I had a choice, I'd prefer to stay away from Wildclaws and Ridgebacks (because I don't think they work with the theme all that well, and I have a lot of WCs already) as well as male Nocturnes (because I just don't like how they look in general =X). I'm a huge fan of matching eyes, so if it's an option, Earth eyes would be ideal, and otherwise, any eye color that matches the primary or secondary (such as Light for Banana or Cream; Wind for Pistachio or Mint; Fire for Ginger or Pumpkin, etc. ); I'd also prefer to avoid Plague eyes because I'm just not a fan. But, eye color isn't a deal-breaker if the dragon has the perfect colors otherwise. Are you interested in Chocolate/Ginger/Latte or Ginger/Chocolate/Latte? Also Chocolate/x/Latte? This pair has Petals (card isn't updated) and can get a lot of colors like Cherry, Cream, Pumpkin, etc.